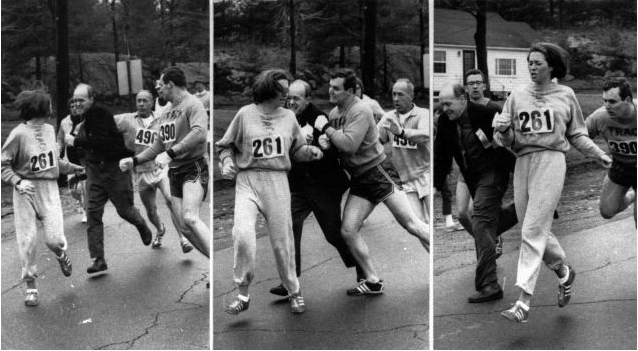 In honor of yesterday’s Boston Marathon, there were a couple great profiles of the trailblazing female runners who forced their way into the race back when it was thought that women couldn’t run 26 miles without dropping dead or turning into men or something. 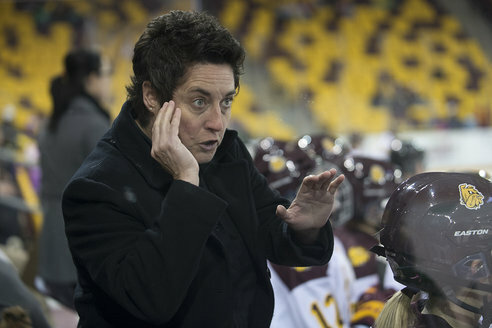 Earlier this month, the Tucker Center for Research released a report on the status of women in collegiate coaching, detailing the continuing decline of the percentage of women coaches employed to coach women athletes at 76 athletic programs. Canadian tennis player Eugenie Bouchard just became the first woman from her country to advance to the semis of the Australian Open in over three decades. Way to go, Eugenie! What do you want to know about her history-making game? How she prepped before facing Ana Ivanovic? What she thinks put her over the edge in this match? How high she thinks she can rise in this tournament? Duh, of course not, you want to know what man she’d date if she could date any man in the whole wide world. Because that’s so relevant to tennis! There’s a lot I appreciate about ESPN’s Body Issue–the primary thing being Danell Leyva. When female athletes succeed, commentators tend to focus on luck and less on physical ability. When female athletes fail, physical ability and commitment are noted. When male athletes succeed, commentators applaud their skill and commitment to the sport. When male athletes fail, it is not necessarily about their failure, but about how their competitors succeeded.